How Can One Get a Sturdy and Beautiful Wooden Garage? The wooden garage is gaining more and more popularity throughout the United Kingdom, and there surely are some reasons to that which we want to explore in the following article. Of course, wooden garages obviously fulfill their main function which is to store the car safely and dry away from pollen, dust, wind, leaves, bird’s feces, rain, hail, snow and out of the reach of thieves. However, there must be some more advantages compared to other types of garages, like stonewalled or made of steel or concrete. One main advantage of ready-made garages is, of course, the quick availability. To build a stonewalled garage from scratch you will usually need some weeks and the drying afterwards will take another few weeks while you could have a ready-made garage – of which the wooden garage is one option – ready to use within a few days. A wooden garage will shield the car from sudden changes in temperatures and also maintain a steady humidity. With these two features combined, condensation will usually never occur in a wooden garage, while the same advantage is not true for garages from steel or concrete. The reason for that is that timber is an excellent natural insulator. It breathes and can take up humidity from the air and release it again when the weather gets drier. So other than in garages from non-breathing and non-insulating materials, in a wooden garage, you will not need to keep a ventilation running to remove moist air from your precious car. A wooden garage will weigh a lot less than a concrete garage or one build of building blocks. Thus, it is usually not required to build heavy foundations to support the walls. A simple foundation plate will usually do. If the ground is wet, it would, of course, be advisable to dig a drainage under it to protect the car and the wooden garage from water from the ground. On a dry, slightly elevated place, just compressed gravel would already be sufficient or anything that is stable enough for the car to drive on. 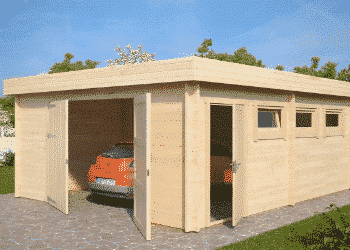 Most wooden garages have a more convenient look than their competition from steel or concrete. Timber or garden buildings built from timber like log cabins or summerhouses do not only have a practical value to provide a dry and safe place for you and your storage, but also look nice in the garden or next to the house and one more advantage of a wooden garage is that it is easily painted in whichever colour fits best to the house. Moreover, there are wooden garages in so many styles and designs that you will have a wide selection to choose from in the first place. Of course, everybody thinks of parking a car when a wooden garage is mentioned. However, the kind of construction with the usually open floor and the large doors make wooden garages fit for some more usages. They can well be used for workshops or ateliers of all kinds because materials and products can easily be transported through the doors. If some work gets dusty, the doors are quickly opened to invite some fresh air in. The large doors are also an advantage when it comes to storage. Big machines or voluminous materials like blocks of styrofoam, even the garden furniture is easily put in and out. Basically, you could see a wooden garage as a wooden shed with larger doors and a free choice of flooring. Also, you might spare some money compared to garden sheds because you don’t need to pay for the wooden floor. A wooden garage can be transformed into a ‘man cave’, a ‘she shed’, a guest room, a hobby room, a playhouse for the kids, a garden sauna, you name it. To modify a wooden garage into one of the mentioned usages in DIY, you can work with timber as the main construction material. Installing things like closets, shelves, workbenches inside will be as easy as extensions outside like attaching a storage shed, extending a roof overhang or cutting a new window. All such ideas would be much harder to realize in a garage from steel or concrete. Just drilling one hole into steel might already cause rust around the drill site. A wooden garage is a good foundation for so many ideas in the eyes of any average DIY-er. A wooden garage combines affordability with significant benefits. Just have a look at our portfolio of wooden garages to get some ideas of what you could do with them.